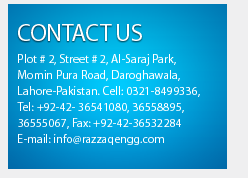 Razzaq Engineering Works, founded in 1986, is a manufacturer of precision, straight bevel, Curvic couplings, helical and spur gears, and gearboxes. The company, a supplier to the Tractor and commercial industries, features an in-house heat treat department and state of the art equipment, including key technologies like gear inspection GOULDER MIKRON & CMM systems. Among our diverse customer base, we have supplied gearing for After market, power tools, Oil Rigs equipment, printing presses, Harvester , Combines & Rotovator machine tools and many other products. Razzaq Engineering Works has a long history of producing high precision gearing for Transmission systems. In fact, REW produces more loose gears for 3 wheeler auto Rickshaw engines 2stock & 4 stock, and Tractors Massey Ferguson , New Holland ( Fait ) , Ford than any other gear manufacturer.